Rasps come in a variety of shapes - rectangular, round, and half-round - and vary in coarseness from finest, "cabinet", to most aggressive, "wood". 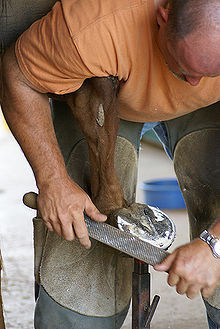 Farriers, for example, commonly use rasps to remove excess wall from a horse's hoof. They are also used in woodworking for rapidly removing material, and are easier to control than a drawknife. The rough surfaces they leave may be smoothed with finer tools, such as single or double-cut files. Rasps are used in shaping alabaster. Saws and chisels are used to rough out alabaster work. ^ Paul N. Hasluck (February 2011). The Handyman's Guide: Essential Woodworking Tools and Techniques. Skyhorse Publishing Inc. p. 119. ISBN 978-1-60239-173-4.